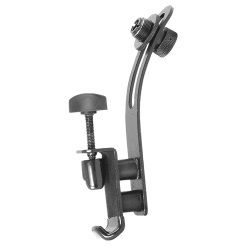 Attaches easily to most flanged, diecast and percussion rims. Isolation cylinders dampen the unwanted vibrations that typically present while miking up drums and other percussion instruments. The improved design has an added flexible rubber coating and a reverse clamp design, allowing for easier setup and removal. Fits 5/8"- 27 mic clips.